Yes, golf (or at least putting) on PowerPoint! A game from 1 to 6 players. 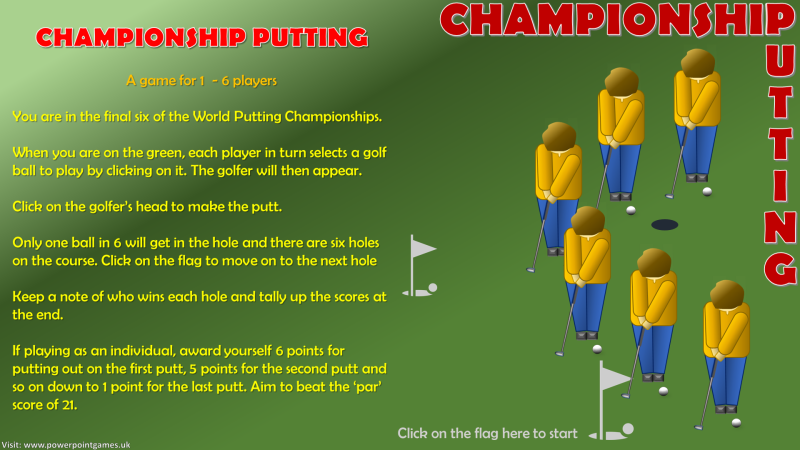 Choose a ball to play, then click on the golfer’s head to take the putt. There are six balls six golfers and six holes to play but only one will sink the putt at each hole. For multi-player games, keep a note of who wins each hole and tally up the scores at the end. For single players, score 6 if your first golfer putts out, 5 if it’s your second golfer, and so on down to 1 point if it’s the sixth golfer. Aim to beat the total ‘par’ score of 21.